The Rotary Club of Concord awarded scholarships to 12 CCHS students entering their junior year to RYLA, Rotary Youth Leadership Awards, a weekend at Fitchburg State College aimed at developing the leadership potential of young men and women. Among the 190 RYLANS attending were our own CCHS students Madeline Mueller, Emily Harrington, Edward Feather, Lucas Wilbur, Ethan Goresitz, Lila Hempel-Edgers, Abigail Mueller, Gretchen Carr, Olivia Mueller, Colleen Boyle, Carson Detweiler, and Elise Dohoney. 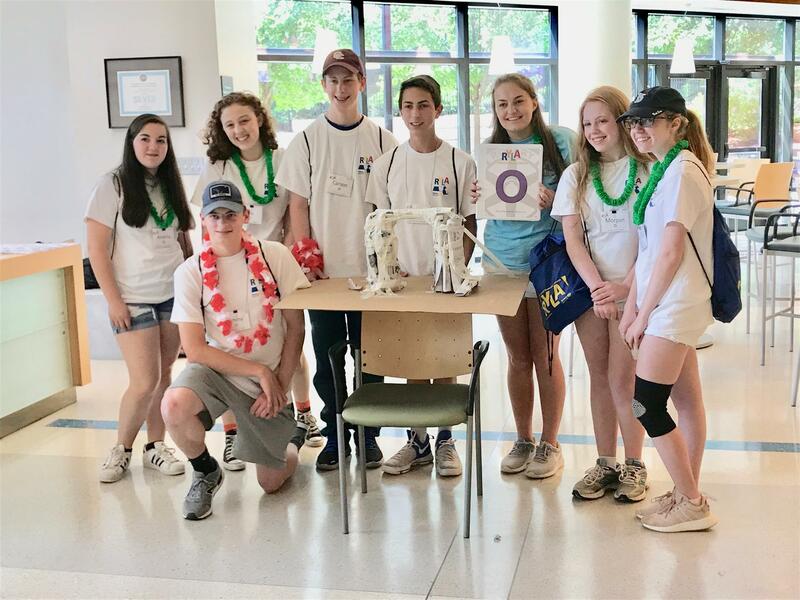 Here is Carson Detweiler (standing, third from left) with his team, posing with a bridge they had to build from newspaper and tape, strong enough to hold a gallon of paint and high enough for the can to pass underneath. They had to accomplish this without talking and within a limited time period. Talk about team work!